We're introducing a new feature this week for Insightly customers on paid plans - the ability to sync selected Insightly contacts with your personal Google contact list and with Gmail. We've got two options for sync, either one way or two way sync. One way sync will copy selected Insightly contacts to your Google Contacts and keep them updated when their details change in Insightly. If you just want a copy of your Insightly contacts available within Gmail or on your phone, we recommend you choose One Way Sync. This option will ensure that changes you make by mistake on your mobile or within Google Contacts will not be replicated back to Insightly and on to other users in your domain. Two way sync will also copy selected Insightly contacts to your Google Contacts, but any changes make to those Google contacts will be saved back to Insightly. If you sync your mobile device with your Google Contacts and you have Insightly Contact Sync turned on, the selected Insightly contacts will also be available on your mobile device. If you have two way sync enabled, changes made to those contacts on your mobile device will also be replicated back to Insightly. Insightly will sync selected contacts with your Google Contacts a few times per hour. Your Insightly administrator has to first enable contact sync for selected users. This can be done by checking the checkbox labelled 'Can sync contacts' for each user under Settings > Users, which can be access via the small silver gear icon in top top right corner (as shown below in Red). 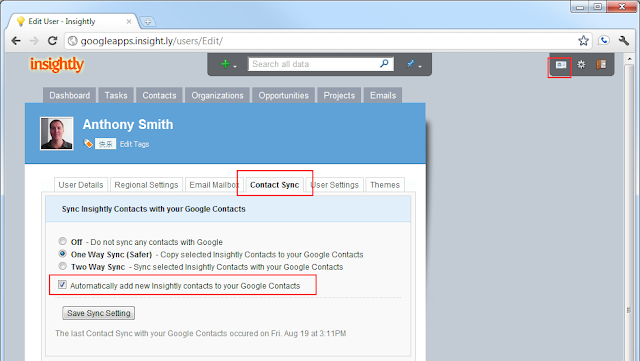 If you want new contacts that are added to Insightly after you have setup the sync (as detailed below) to also be added to your Google Contacts, be sure to check the checkbox below the sync options to include new contacts too. We always recommend you back up your Google Contacts before you enable sync. You can do this from the 'More' drop down in Gmail Contacts as shown below. You can add your entire contact list to the sync in four steps as in the screenshot below. 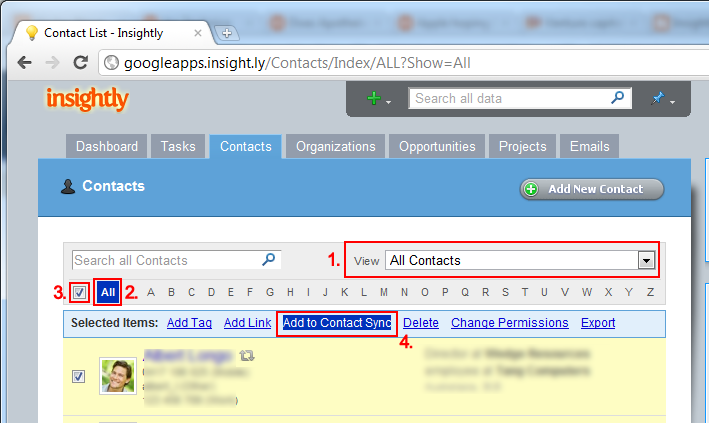 First select "All Contacts" from the contact view, then click on the "All" link in the header to bring up the entire list on one page, then click the checkbox in the header to highlight the whole list, and finally click the "Add to Contact Sync" hyperlink to add all the contacts into the sync. After you've enabled sync, you can then select which Insightly contacts you want added to your personal Google contact list. To add contacts to be synced in bulk, click the checkbox next to the contact names in the contact list, and choose 'Add to Contact Sync' from the menu that appears at the top of the list (as shown below). You can also add and remove individual contacts from sync via the Edit menu when viewing a single contact (as shown below). To see the list of which contacts are currently included in the sync, and to remove individual contacts from sync in bulk - select the 'Contacts included in Contact Sync' view from the Contacts list. To remove contacts from sync, select the contacts and click the 'Remove from Sync' link in the menu at the top of this view. Contacts that are synced will have a small sync icon to the right of their names in the list (as shown below). Contacts added to your Google Contacts will be added to a group called "Insightly-Contacts" and also added to the “My Contacts” group. 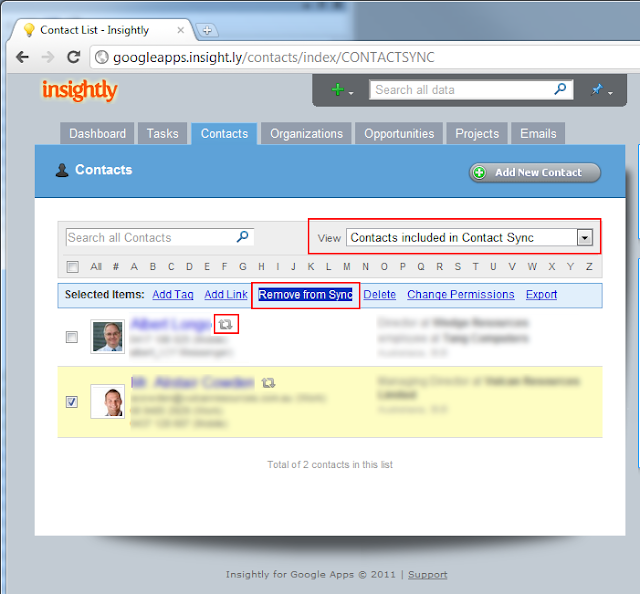 The "Insightly-Contacts" group will be created within your Google contact list by Insightly the first time the sync is run, and it's used to keep track of synced contacts. Do not add contacts to this group yourself or those contacts will be deleted. 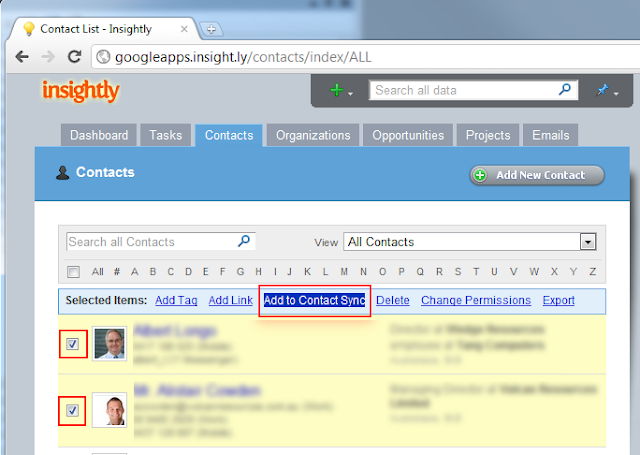 Insightly will sync the contact name, photo, addresses, phone numbers, email addresses, dates to remember, roles and linked organization names, and the background information from the Insightly contact will be synced with the Notes field in the Google Contact. You can turn off the contact sync from the 'My Info' page accessible via the card icon in top right corner of Insightly (as shown below). Doing so will remove all the synced Insightly contacts from your Google Contacts. 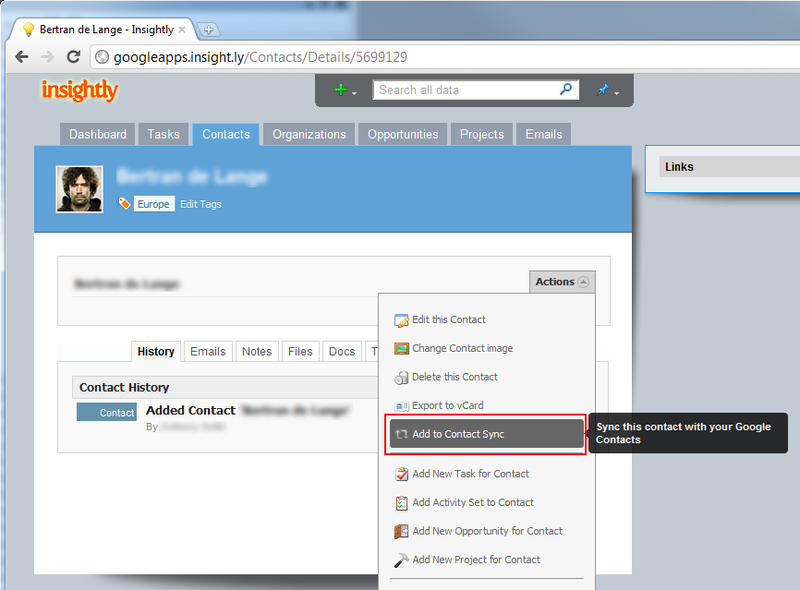 We hope you find the new contact sync feature useful. 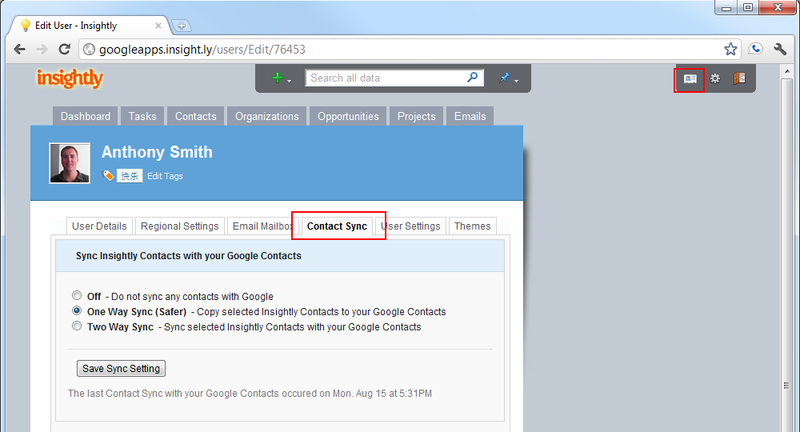 Sync is now running full speed, and your contacts should be in Google Contacts now Jamie. Resync will happen a few times per hour to keep contact details up to date. I agree. One way sync should be default with option for 2 way sync. This should also be available on free plans. also i just noticed that i cant sync my other users. Hi, if you are using this new feature, could you please left your feedback about it? Are you satisfied? Can you add an option to not delete contacts when sync is turned off? I imported many contacts from my Google contacts. When sync is turned on, it duplicates them in Google contacts. I prefer to remove duplicates. If I do this, and turn off Insightly sync, it will delete my contacts in Google, which is not preferred. A little confused. With two way sync am I able to add a contact to Google Contacts and it sync back to Insightly or do I have to always add new contacts to insightly? Is it also possible to sync contacts with Google Shared Contacts so all users have access to the contacts via Shared Contacts? Guys, I can't see the "Can Sync Contacts" option, I have enable access for Insight.ly, however the only options I get are "Admin" and "Can export data". Any ideas guys why this is????? Can I add a new contact from my iPhone? Or will it be deleted too? Does this also sync with the global contacts in Google or just the personal ones? We would like to access the same list of contacts throughout the company with everybody able to add, delete and edit these contacts. I've also completed the setup but 30 minutes and still no contacts in Google? It says photo is synced, it wasn't in August 2011 when the text was written nor last week either... I requested that feature when I used insightly but never came... Still not there more than one year later or am I missing something? Contacts Tags should be sync with google group tag. With the latest update to Ensightly there's no "Select All" option as per step 2 above. Please advise how to bulk select all contacts. It's not feasible going through page-by-page.